Archives of Eaton Bray News for September 2006. This article was published in September 2006. Please see Latest News for more recent information. The Lions get off to the worst possible start as St Josephs scored inside the first minute. A long cross was headed into the net. However the boys respond tremendously to deliver their best performance of the season. On nine minutes they equalise. Ben Walsh takes a curling corner from the left that beats everyone and hits the far post. As the ball span along the goal line, captain for the day, Jayden Newman reacted quickest and slammed the ball into the net. The boys produced some great attacking moves during the half, Ben a constant threat with his excellent runs down the wings. Within a minute of the start of the second half, the Lions had the lead. The St Joseph's keeper could not hold Ben's cross and Matt Glover was there to prod the ball into the net. The third Lions goal was an absolute screamer. The ball was cleared out to Jayden who hit an unstoppable shot that flew into the top corner of the net. The Lions continued to play excellent attacking football right up to the final whistle. The defence was very solid and all the boys played brilliantly. MOM awarded to Jayden. An impressive start by Watling and within the first minute of play, after a superb run by John Clarke he had secured Watling's 1st goal. The Lions soon responded and from a corner kick, Nathan Sears headed the ball into the back of the net to even the score. The Lions continued to put pressure on Watling and made several more attempts on goal. It wasn't long before the Lions midfield passed to James Pearce to secure Lions 2nd goal. Watling continued to battle and managed to beat the Lions defence only to hit the goal post. A throw in from the Lions midfield and James Pearce was able to score their 3rd goal just before half time, making the score 3-1 to EB Lions. The second half saw Watling keen to even the score but again the Lions midfield penetrated the Watling defence and Will Sanders scored Lions 4th goal. Watling showed true determination and began to really put the pressure on the Lions defence. It wasn't long before Watling's Sam Ling had scored their 2nd goal. Watling continued to apply pressure but just couldn't get the ball pass the Lions keeper. These teams were closely matched and play was untidy with several missed chances from both sides. Lions went one down when a Dunstable forward pushed Alex Lay off the ball and went on to score. Lions were awarded a penaly when the ball was handled in the are and Alex Kirkwood confidently scored but Dunstable got their second from a great long shot just before half-time. Lions wasted several more good chances and Alex Lay and goalkeeper, Dean Clark, had to work hard in defence. Ed Poole got through the Dunstable defence but was brought down by the goalie resulting in another penalty from which Kirkwood scored again. In extra time both teams came alive and we saw some exciting football. Dunstable scored in the first period and Lions threw everything into the second period and were rewarded by a craking goal from Danny Law in the final seconds. The penalty shoot-out was tense and not helped by Dunstable celebrating prematurely. The teams were still level after five penalties but Dunstable kept their nerve. Author in 'I quilt' shocker! Quilting expert Mary Mayne, who has won top awards for her impressive work, has now pieced together her first book. The Eaton Bray craftswoman has created countless clever quilts including one bought by the then National Postal Museum and another which is still on show at Bletchley Park. 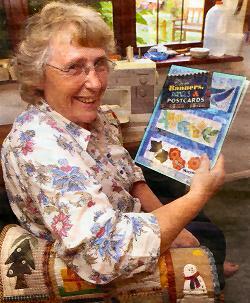 Mary, 66, who lives in Medley Close, has shared her skills through workshops, articles, and talks, and has now had a book published by the American Quilter's Society. Called Clever Banners, Panels and Postcards, it contains designs and guidance on creating small examples of quilt work which can be combined to make larger pieces. The grandmother, who has two sons, one daughter, and two granddaughters, said: "I'm pleased I've done it. "It really has been a great experience. "I never thought I'd get round to doing anything like it! "I've worked with some nice editors, who have helped me an awful lot, and I'd like to think that maybe one day, there might be a follow-on and I could do another one. It has been fun." And she added: "It's not a book that would frighten a beginner." Husband Peter and the rest of the family are thrilled with her new book. Mary said: "They're absolutely delighted, they are over the moon." Mary and Peter moved to the village 46 years ago, as newlyweds, and have lived in the same house ever since. Mary, a self-taught quilter, took up patchwork as a hobby in the early 1960s and gradually improved her skills. Her first appliqued quilt was the Eaton Bray Village Quilt, which took 11 months to complete, and depicts scenes from the village. Some of the best-known scenes include Eaton Bray Village Hall, the Coffee Tavern, Eaton Bray Lower School, the White Horse, St Mary's Church, the store and post office - and Mary also included her own home. An award-winning quilt bought by the postal museum was all about the history of postage stamps, postal workers' uniforms and methods of delivery. It was made to celebrate the 150th anniversary of the postage stamp, and was the first work of its kind to be bought for the museum. She has organised the planning and making of the Bedfordshire Millennium Quilt, which was produced by a team of 34 ladies and one man, and oversaw the creation of the South Northamptonshire Millenium Quilt, too. Another project saw Mary working with villagers in Bedfordshire to give them advice and encouragement on making quilts for their own villages. The quilting expert also hosted quilting weekends for Hilton Hotels for a number of years, and has held workshops and given lectures overseas. She has been involved in judging, including acting as a judge at the Festival of Quilts in 2004 and 2005. She still holds workshops, and is a long-standing member of the Quilters' Guild of the British Isles. Several years ago, the guild commissioned Mary to make their new "logo quilt", which is put on display at exhibitions. Asked what she most enjoys about quilting, Mary reflected: "It's so relaxing. "An hour can go in five minutes when you are working away. "I just thoroughly enjoy it. I've always enjoyed needlework anyway. "It just seems to be a natural thing to do." "And I just love it." 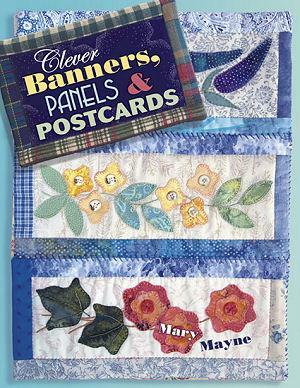 -- Mary's book, "Clever Banners, Panels and Postcards", costs £15 and is available from Patchwork Pals at Leighton Buzzard Garden Centre, Hockliffe Road, Leighton Buzzard. -- Mary will be signing copies of her book at the Christmas Exhibition and Craft Fayre being held at The Village Hall, Cosgrove (MK19 7JH) on 5th November 2006. For further details see the Thames Valley & Chiltern Air Ambulance Trust events page. The change from weekly to fortnightly dustbin collection predicted in the LBO last week has been voted through by councillors. South Bedfordshire council (which covers Eaton Bray) is aiming to be among England's top performing waste recycling districts, with the introduction next year of a new alternate week household refuse/recycling collection service. It is hoped this will encourage residents to recycle more of their waste, although it is likely to be an unpopular move with many people, who will just view it as getting less service for their spiralling council tax. The decision to drop the weekly bin collection in favour of a fortnightly service was made at a meeting of the district council's executive committee last Tuesday. Householders will have their refuse (black bins) collected during one week and their recyclable waste (orange sacks) during the following week. The current fortnightly composting (green bin) collection service will continue unchanged, as will the weekly refuse (black) service to blocks of flats and properties on black sack collections. South Beds Council's executive portfolio holder for the environment, Cllr Brian Spurr, said: "All the evidence in other authorities has shown that the introduction of an alternate week collection [AWC] service encourages people to recycle more of their waste and reduce their refuse, which is exactly what we want to achieve as a council, in order to make South Beds a cleaner and better place to live. "Most of the districts that surround us already have an AWC service and those that don't are considering introducing it. "If has worked successfully in many areas, in fact 80 per cent of the high performing local authorities, in terms of recycling, use this method of waste collection. "Provided the reasons are clearly explained to residents and it is effectively communicated, it is generally widely understood and accepted. "Landfill sites are rapidly filling up and local authorities face significant penalties unless we continue to improve our recycling rates and reduce refuse." An information campaign will be rolled out to explain the details of the new collection service to residents, as well as provide advice and support on how to reduce and store refuse, and the environmental benefits of recycling more waste. Three key players had departed from the Lions' team since last season but they were keen to try out their new lineup. Their supporters were shocked at the size of the Langford goalie, who was at least six feet tall, well-built and could have been mistaken for David Seaman! Langford took advantage of a defensive mistake to score an early goal but Lions equalised when Jack Coates ran on to a forward pass and struck the ball past the goalie. Both teams battled hard and Ross Taylor worked well in midfield but after twenty minutes Langford began to exploit weaknesses in the Lions' defense and scored 3 more by half time. After scoring their fifth, Langford substituted their goalie - only for him to return to the pitch to play in midfield. Nobody could beat him in the air, tackle him or match his speed. It was like watching a grown man play against children. Despite determined attacking play by Morgan O'Connell and brave work in defence by Lee Cavendish, Langford scored another five. MOM went to Lions' new goalie, Marco Woodgate, for bravely facing up to the onslaught. Newly formed team, NGS, were an unknown quantity. It soon appeared that Lions' players might have the edge in terms of skill whilst NGS were the quicker side. Dylan Taylor worked well in midfield for Lions and Stephen Broughton was tackling well. Both teams had several shots that were wide or high and Dean Clark made a couple of good saves, but it was almost half time before Ed Poole steered the ball past the NGS keeper. NGS responded immediately by beating the Lions' defence and drawing their goalie off his line. In the second half NGS had a couple of goals disallowed for offside. Alex Kirkwood took a good corner for Lions and Gareth volleyed the ball into the back of the net. This was quickly followed by a skilful move up the wing by Ed, passing to Robbie Luck, who scored Lions' third. MOM went to Robbie for his brilliant defensive play as well as his goal, but all the team played well and it was a promising start to the season. NGS will be a force to be reckoned with once they have gained more experience. "Body Language" is a more important form of communication than most people realise - in fact only 30% of our communication to others is verbal. This was the subject of guest speaker Mr Vic Botterill's interesting and humerous talk to the September meeting of Eaton Bray WI. As an ex police inspector his work gave him many years of observing other people's body language. He demonstrated some of the various signals that we all use in different ways when communicating with other people, and the reactions to these depending on the relationship with the person we are communicating with. Animals have the ability to instantly recognise our human body language and know if they are to be fed or go out. Mr Botterill highlighted the signals our body language conveys to others when our personal space is invaded, by demonstrating with members, causing a great deal of laughter. Included in the monthly business was a request for members to help in promoting our local WIs on special promotion days at local garden centres. This is part of a national WI scheme that is taking place throughout September. Members were sad to hear of the death of Joy Cuss after a long illness. Joy had been an active Eaton Bray WI member and supported for many years, and sympathy was expressed to her family. The next meeting is on Monday October 2 at 7.30pm in Eaton Bray Village Hall. The next parish council meeting will take place on Monday 2nd October. Wee mateys at Northall Village Hall raised the masts, set sail and pretended to be shipwrecked on an island at the 2nd annual 'Churches Together' Summer Club. The summer club is an ecumenical event with children, aged between five and 11 taking part from all the nearby village churches, including Salvation Army, Methodist, Baptist, Anglican and Roman Catholic. This year the theme was pirates and more than 20 'crew' attended dressed in appropriate clothing. 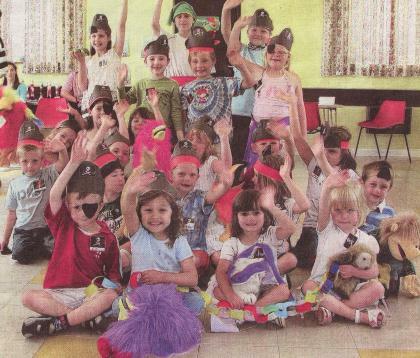 The children made their own pirate hats and eye patches on the first day to wear during the week. The message for the week, that Jesus loves everyone, was told through the story of Paul being shipwrecked on Malta. Children also had fun with games, arts and crafts, and hunting for treasure in the grounds of the village hall. It was such a success that many are already looking forward to next summer. You are viewing the September 2006 archive.